Free Oregon Trail cross stitch pattern/chart. This will be my next project once I finish all my WIP. It’s based on The Oregon Trail, an 80’s game. It’s quite frustrating and addictive at the same time. 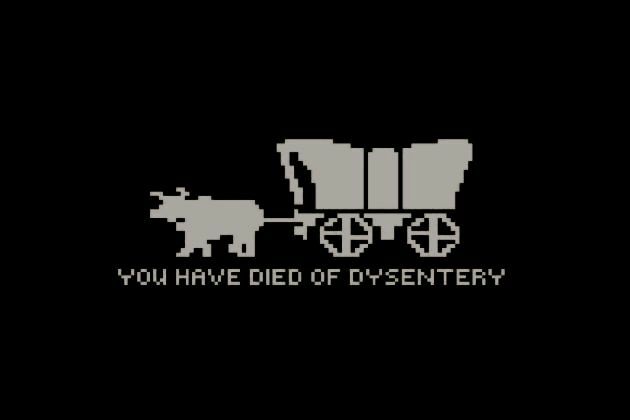 I remember playing it many years ago and actually dying from dysentery a few times. I did finish it too, not with all the crew but they ended up in Oregon anyway (someone drawn in the way and a couple of them had broken arms…). I’m still not sure about which colour I’m going to use, I’m in between DMC white, 906 and 907 (I might go with 907 just because it’s almost neon, just like the game colour). It will be worked in black 14ct Aida cloth. I went to Michael’s today just to pick the green colour (I bought both 906 and 907 and then some extras…), and I happened to come across the the black Aida cloth! It’s the first time I’ve seen it in stock so I had to grab it too. *Other options are adding orange/brown to the ox and wagon details. Play The Oregon Trail Deluxe (1992) here. Play The Oregon Trail (1990) here. I made the chart based on the most accurate (to the original game) picture of the wagon I could find. Free Minecraft cross stitch pattern/chart. My favorite thing to do on that game was set the most ridiculous pace possible, with as little food as possible, and see how many days my family would last. Never long, but I was amusing. Also that pattern is amazing and looks just like the old death screen. They were set to die haha I used to always chose the rapids at the end (if I made it), and they used to die there. But yes, it was pretty amusing too.